The last few days have been super busy. Pardon me, I have neither blogged nor visited any blogs. There were so many unread posts in my blog reader and I felt so restless that I closed my eyes and clicked "Mark all read" for all of them. 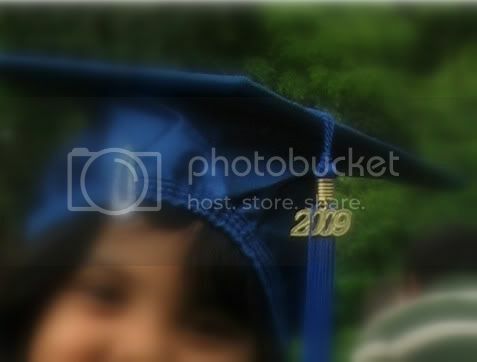 In other news the 5 year old graduated...ahem, only from Kindergarten. But they had a full ceremony with a cap and a robe followed by a luncheon. It seems like just the other day that S started going to daycare/pre-school, bawling her lungs out and turning my knees into jelly. She has certainly graduated from a crying 2 year old to a school loving 5 and once again I feel the butterflies in my tummy as she looks forward to Grade 1 in the bIIIIg school. But that is not until September and till then she still has summer camp to enjoy at her old school. After a hectic week of a ramshackle house and eating out almost all week, I wanted to bring some sanity to the body over the weekend. The body was craving something earthy with the lightest hint of spices. Made a simple Methi Rice with methi (fenugreek) greens from my container garden. 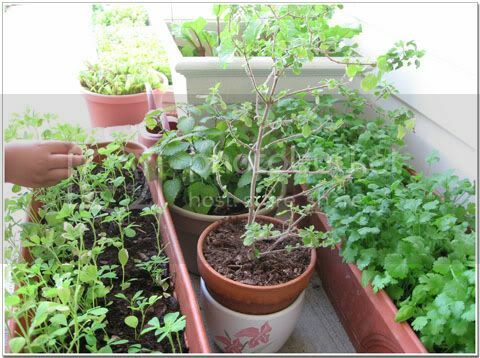 I planted methi, corriander, basil, lemon balm, swiss chard and some beet in containers on the patio. D has tomatoes, squash, okra, pui saag(pohi greens) and some other stuff in our small backyard veggie patch. He started late though and I don't know when we will see any produce. 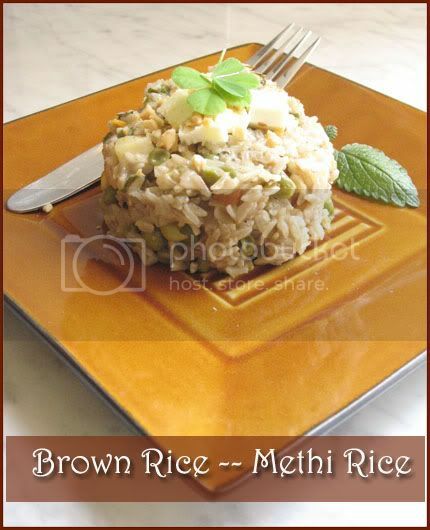 The Methi Rice or Rice with Fenugreek Greens I made was with Brown Basmati and it is not much of a recipe, more of a coming together of ingredients around the house. I did not measure anything and what I have here is more of a ball park estimate than approximate. This goes to The Heart of the Matter # 27 whose theme is Best of June's produce. Once the rice is done, add 1/4 cup of crumbled paneer and mix well. Garnish with coarsely grounded roasted peanut. Trivia: Methi or Fenugreek is popular both as a herb and as a spice(the seed). Supplements of fenugreek seeds has been shown to lower serum cholesterol, triglyceride, and low-density lipoprotein in human patients . Methi from Qasoor in Punjab is very famous in its fragrance throughout the country and known as Qasoori Methi. You guys are the best, you will eat our crappy cupcakes and still ask for more. 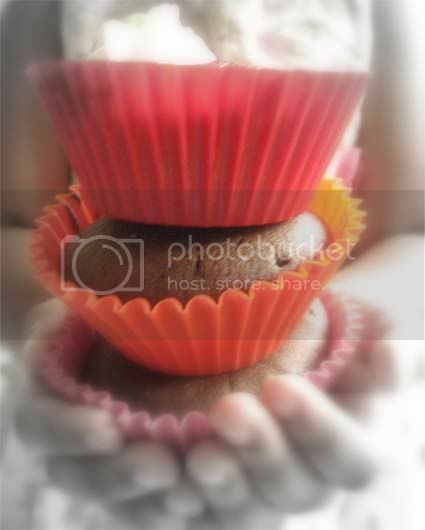 S and me made these chocolate cup cakes for Father's Day. 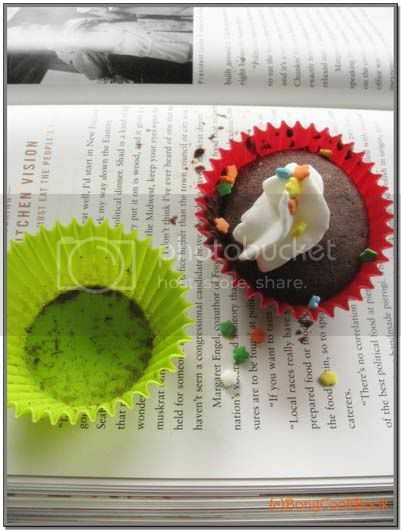 Given my history of baking, these turned out so perfect that I was well shell shocked. Thanks to Nags of Edible Gardens for the step by step pictures and no, this time I didn't use my brain at all, just followed instructions. I didn't do the frosting so S did the whipped cream and sprinkle thing to decorate. The dad really enjoyed these along with the chaotic lunch at Cheesecake factory and a t-shirt (a size too small) with the girls smiling on the world from it. The title of my post might have you baffled, there is no correlation between the phrases before and after "and" except of course for me both has to do with food. I have been blogging for some time now with considerable gaps in between.In my blogging life many of the people on the right sidebar, on my archaic blogroll has fallen off the blogosphere. I still have them there,I don't update that list, it is a list of all those bloggers I had encountered early on. There is a special connection with them, no I don't know their e-mail ids or anything about them except what they cared to put on their blog but I still have them like old friends. The new ones with whom I have forged a connection are on my Reader, as I get to know more I slowly add them there. And though I try to keep my virtual space separate from the real one, for me the same basic rules apply for both. If a friend in my real life would have been hurt I will stand up for her. If I meet people who don't mind their P's and Q's I would gently try to remind them (come on I am a Mom, that is my job). 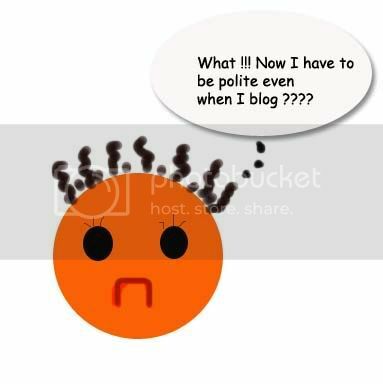 Blog Etiquette 101 for the un-initiated. Readers are welcome to add on to this. 3. Everyone has a right to their opinion. Just like you have so does the blogger you are bashing. When your post is a rant/bash against another blogger's posts, do so openly and politely. Give a link to the post you are venting against, clearly voice your opinions and state why you disagree/agree. This will prevent readers from leaving snide comments and generally enjoying a controversy. 4. If your rant is not triggered by another blogger's posts and it is your own original copyrighted rant do not encourage comments which seem to suggest otherwise. That means, do not say " Thanks for understanding" and such nonsense when a reader comments "Yeah how can someone make Bitter gourd with brinjal, ridiculous"
5. Even if a blog post makes you mad, do not use bad language that might hurt the blogger's sentiment while blogging or commenting. You see only a slice of a blogger's life on the web, you have no clue as to what might have made her write/think that way. If you are still angry, take a deep breath and practice Bhujanga asana. 6. You have full freedom to bash anyone from your personal life on your blog. If they read you, god bless you my child. 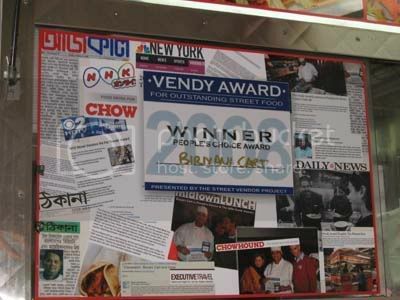 Biryani Cart, winner of the Vendy Award has an awesome menu. It was hard to decide what not to eat with the kind of food they had there. 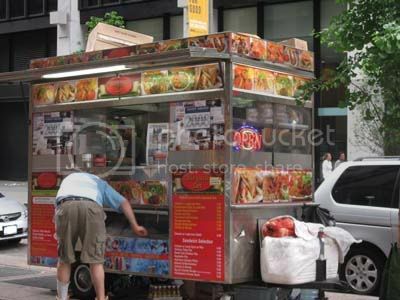 If you are in the area do check out this cart on 46th and 6th. 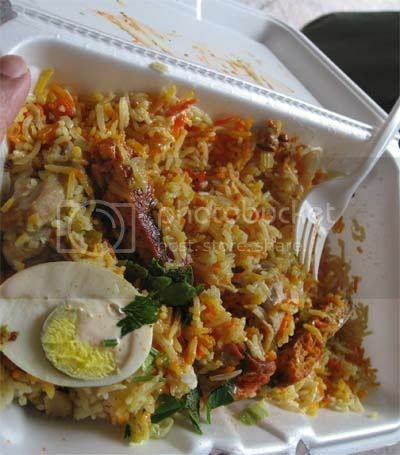 And can you believe how cheap it is, the box of biryani came at $5.50 and so did the other one and the quantity is a little over sufficient for a hungry adult. Ok I ate one whole box, so what !!! There is no place where you can sit and enjoy your meal though, you can pack your lunch from here and have a nice picnic at Central Park instead. ... a Lamb on Rice. This is an Afghani dish but at this particular cart the dish is more spicier and tasted much better than what I have had before. Do you see that proud Vendy Award winner cert ? 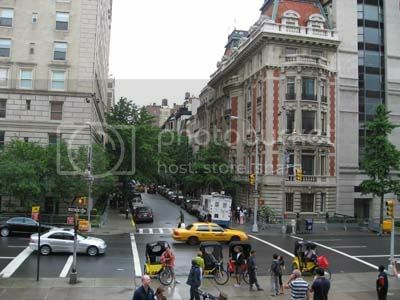 Rickshaws in front of the Met. A greener, cleaner Calcutta ? 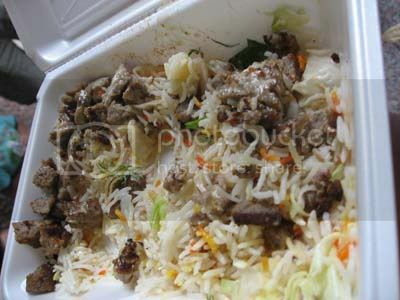 We then had Kati Rolls after just 3 hours of this at the Kati Roll Company. We shared two unda chicken rolls and unda shammi kebab rolls. They were delicious and too filling. I liked the Egg Chicken Rolls better than the Shammi Kebab one. My woe of missing out on Calcutta style Rolls were assuaged by 95%. Jeet Thayil of India in New York says that "If you have to ask what a Kati Roll is, you haven't lived." So true. But back home it is more popularly known as The Egg Roll except of course at Hot Kati on Park Street(Kolkata) whose rolls are famous as Hot Kati Rolls. I hope the Hot Kati guy knows how his naming is the food lingo in the streets of a busy city across the globe. Oh, and I forgot to ask something very important. I need some help from my readers here in the US. If any of you have used the following colors for your home, please,please leave me a comment with your e-mail id. I want pictures of homes painted with any of these -- Benjamin Moore Suntan Yellow, BM Lemon Sorbet, BM August Morning, BM Patina, BM Apple Crisp and BM Asbury sand. Please, this is Urgent, search for the right color is keeping me away from the blog so please help if you can. 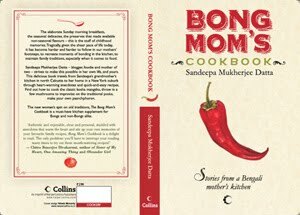 I have always talked about how Bengalis love bitterness, not in life but definitely in their food. A traditional Bengali lunch will almost always begin with some bitter preparation of Bitter Gourd or bitter tender Neem leaves. This is in sync with Ayurveda, with the concept of cleansing your palate before you delve into more complex and rich food. 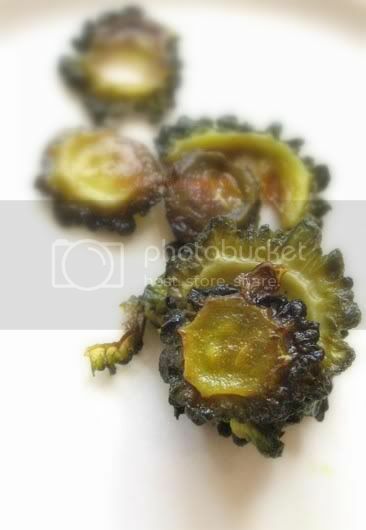 Of all the bitter foods that we Bengalis are subjected to since childhood, I would say Bitter Gourd or Uchche is the meekest. After years of being subjected to chirotar jal ( chirota, a plant whose leaves were soaked in water to make a bitter concoction), first thing in the morning on weekends you do start appreciating uchche. Even thinking of chirotar ras gives me the shudders and makes me glad that I grew up and have enough liberty to declare a chirota free house. 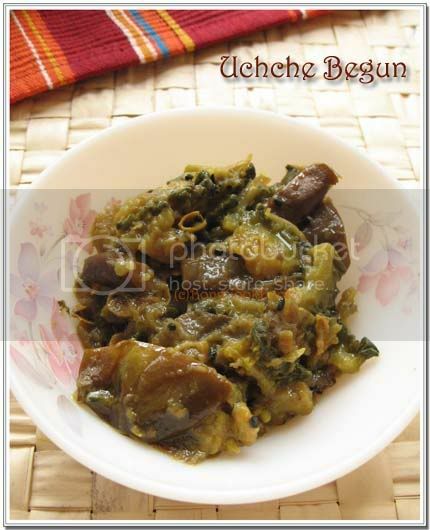 Though I have got over those bitter plants, bitter gourd or uchche is a staple on the menu at my home almost every other week. D loves it(yewww !!) and S eats it dipping it in a bowl of yogurt. The Earth's population will surge to EIGHT BILLION by 2025. With increase in population comes an increased demand of food. When this surging population consumes more food that it is able to produce, food prices skyrocket as it did last year. While we balked at the rice price last year we also gradually became accustomed to it. It is not the same for all people though, higher food prices push more people towards poverty. A's nanny says in Bangladesh food prices are so high that it is hard for the middle class to feed themselves unless one member of the family works in the western world and thus earns high wages. To meet rising food demand, intellectuals say we need another Green Revolution, the kind that doubled the grain production in Asia especially India during the 60s and 70s. Really ? Aren't theHigh-yield grain varieties, pesticides, synthetic fertilizers and the works that worked wonders at the time showing there wrath now. Why do you think villages in Punjab, our one time 'bread basket' are suffering the wraths of cancer today ? A Greener Revolution may work better says an UN Panel. Duh ? Sustainable farming methods such as composting, crop rotation and interplanting with legumes has been proved to better soil quality, increase yield and reduce reliance on synthetic fertilizers. An interesting low cost project in norther Malawi in Africa, SFHC (Soil, Food and Healthy Comunities project) distributes legume seeds, recipes and technical advice for growing crops like peanut, pigeon peas and soy bean which enrich the soil by fixing nitrogen while enriching the diet as well. 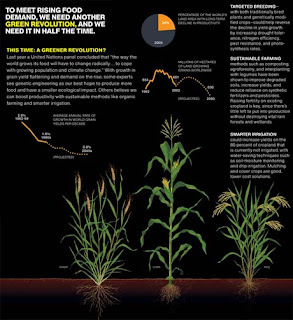 Farmers there say, that by crop rotation they have increased yield and cut down fertilizer usage by half. Which model will prevail will depend on the powers pushing them. But whatever it is, the surging masses needs to be fed and if that can be achieved with a lower ecological impact planet earth will have few more years of survival. I love my legumes, a bowl or two of Dal a day keeps me happy. While my favorite is the Red Masoor Dal I rotate my legumes to take advantage of all. Mator Dal or Split peas are the dried peeled and split seeds of Pisum sativum. They come in yellow and green varieties. They have been mechanically split so that they will cook faster. Though this dal is relatively common in Bengal, my Ma seldom made it except for in a Tak Dal and consequently I never did. A friend introduced this to me. 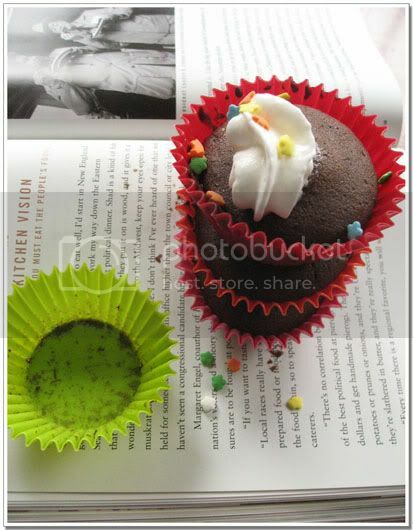 And it is she from whom I got both the recipes. 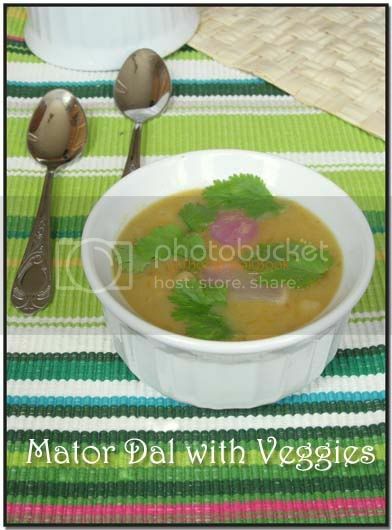 These are the two ways I have made Mator dal(Split peas) one with veggies the other without. For indexing purposes they are two separete posts. 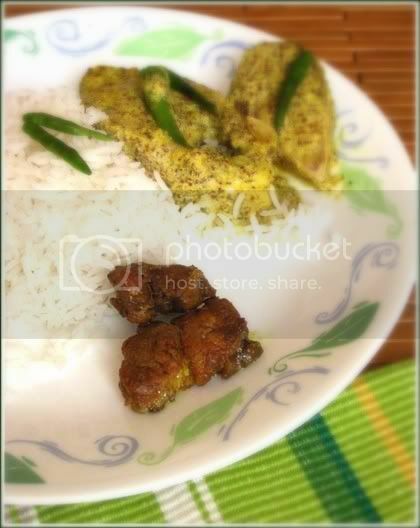 The Begun Bhaja or Fried Eggplant is a very simple Bengali delicacy. 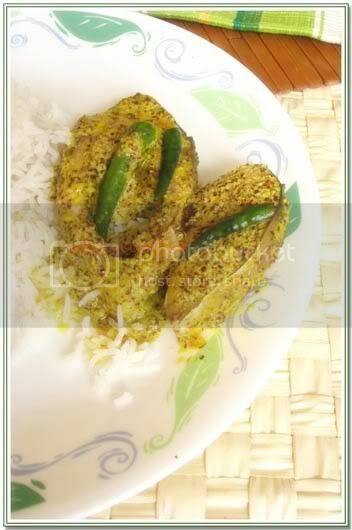 I see a lot of recipes where the Begun Bhaja is prepared with lots of spices but the ones I have had in my home or other Bengali homes and eventually make are always the simple ones with absolutely no spice other than turmeric. They do soak up some oil so I fry the slender japanese eggplants chopped in mini rounds to have smaller portions of begun bhaja, the oven baked ones are no where near in taste. 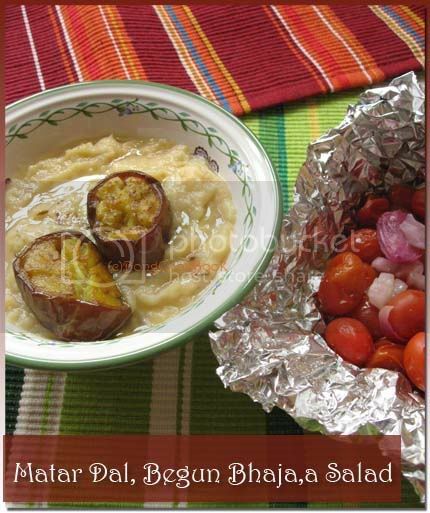 We enjoyed this simple Dal with some Begun Bhaja and a roasted salad. Trivia: The yellow Split peas is the legume used to make Pease Porridge as in the popular children's rhyme "Pease Porridge Hot"
Wash and cook 1 & 1/4 cup of Yellow Split Peas in the pressure cooker with a little turmeric. About 5 mins at full pressure. You can also cook in a pot, only it will take some time. Update on June29th,2013: Today I cooked the same Motor Dal with Pumpkin and Edamame in pods. Also added some grated ginger towards the end. Awesome. Now the pics here don't do justice to the actual Pulao for see I couldn't have clicked the pictures with friends around, they would have thought me crazy. 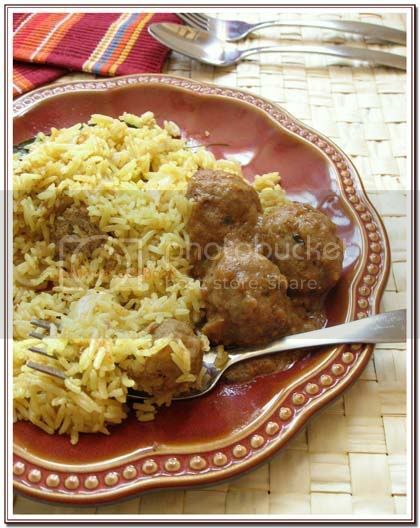 With the leftover Kofta curry I had made a small quantity of pulao for just us and took some hurried pics before I would see the end of it. When Kalai left a comment on my last post I could very well identify her. Far away from home and family, the friends in this adopted country are our extended family now. Their kids are my daughter's cousins and they play a big role in shaping her life. The girl in white on the beach is the elder sis that S can look up to. I have seen her grow from a toddler to an almost teen and she is the perfect role model any 5 year old should have. I am thankful for these friends and their kids and hope S and A bring as much happiness to this extended family as they do to ours. Heat Oil + 1/2 tsp of Ghee in the Kadhai/Wok/Frying Pan. Drain the rice and add it to above. Do not add water at this point. --- spread the kofta gravy at the bottom layer with some finely chopped corriander. --- add a layer of the rice. 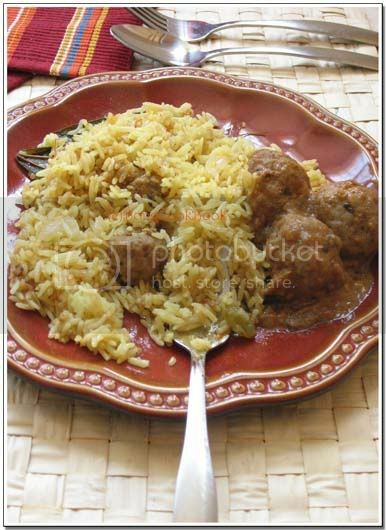 --- top the rice with a layer of the gravy, 5-6 koftas/chicken balls, some golden raisins, chopped corriander leaves, 1/4 tsp of Biryani masala sprinkled over. --- now again add a layer of rice. --- finally top it off again as before. 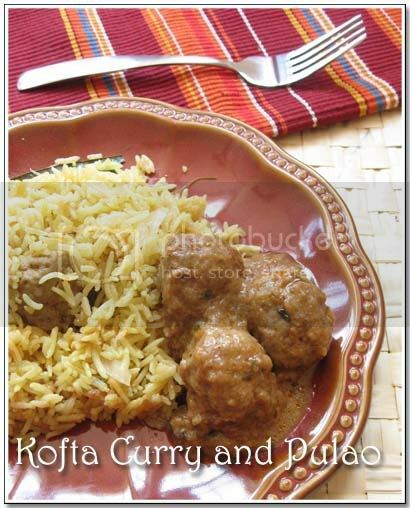 Serve with some of the Kofta Curry and a Raita. It is delicious to say the least. The past(the one before the recent one) weekend was a long one, not long as in l---o---o--o-ng but merely long. A friend decided to come and stay with us for 2 of the three days. No one asked, they simply notified and rang the bell Saturday night with two kids, a wife, two pillows and several other paraphernalia. Well we have known them for years and such privileges are acquired if you know one for long. I was a bit weary of the situation. Given my recent stranger anxiety along with baby A's I wasn't sure how things would pan out. That they had a 3 month old who according to the parents was colicky and could wreak havoc by crying(again according to parents) didn't soothe my tense nerves. Things turned out very well though and everyone had a blast. Sunday was well spent at the beach. It was a bit cold but nothing to keep the kids away. Big Sis S, her friend M, her two pseudo cousin brothers A&A and a pseudo elder sis G had loads of fun at the beach and then later on the rides at the boardwalk. Baby A doesn't like strangers and that means any adult outside the family and her nanny. She also doesn't like to be bound in any static object like highchair, bouncer, static strollers etc. And she doesn't keep her dislike to herself, she protests loudly and monotonously. 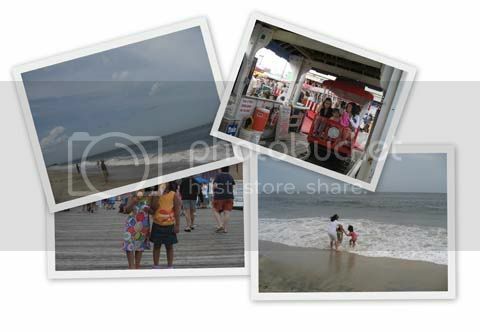 So she had to be carried while the older kids played on the beach or on the rides. She is a petite child, very much so and carrying her is easy, so many friends aka strangers volunteered but she pouted and her eyes wailed up at gestures of such love and intimacy. She clung to her not so petite Mom and generally had a mighty good time watching everything from a safe perch. Back home she was intrigued by the 3 month old. At every opportunity she would scoot up to his bouncer, stand up and try to poke his head, face whatever. She also tried to take away the smaller one's pacifier several times. The 3 month old didn't really cry all that much or maybe I have just got used to such stuff. Big Sis S had a great time overall with her friend M(the visiting couple's elder daughter) who is same age and that brings me to a niggling doubt which I will throw at you as a question. What do you do when you have house guests and your parenting principle does not match theirs ? The husband is pretty non-conformant and dishes out same sermons/scoldings/rules to all kids. Fortunately since most of these people are close friends no one minds. I am a bit hesitant though to do the same. What about you ? Since Saturday night we all were invited to a friend's party and Sunday lunch was outside, I had decided to serve a homecooked meal on Sunday night. I knew I would be dead tired and maybe even crabby by the time we came back home Sunday evening. So I had decided to do a pualo and a gravy, a part of which could be cooked the day before. D would be grilling hot dogs and corn to supplement the meal. What I made was a Chicken Kofta Curry (Chicken meatballs in a gravy) and then a Kofta Pulao (a meatball pulao) with some Raita to jazz it up. Both the curry and the pulao are a major hit with family as well as friends. And so even though we were almost full with the continuous snacking and grilling we sat down for a late dinner at 11 in night to devour these delicacies. This particular dish serves 3 purpose at 3 stages of making. When you make the Chicken masala balls, you can fry them and serve as appetizers. The following quantity makes about 40-50 meatballs. All of them will NOT be used in the gravy. To make Chicken masala balls I follow this recipe mostly. Roughly I will repeat here. Wet grind to a fine paste 1 medium onion + 5-6 cloves of garlic + 3" piece of ginger + some chopped corriander leaves + 8 indian green chili(go with few if your hot tolerance is low). Fry some of these balls and serve as an appetizer. The rest will be used in the gravy. To use in gravy you NEED NOT fry the balls. Alternate Idea : Boil the raw onions. Cool and grind to paste. Make a separate paste of ginger + garlic+green chili. Make a puree of the tomatoes. You have to spend a little more time to fry the onion paste in this case. 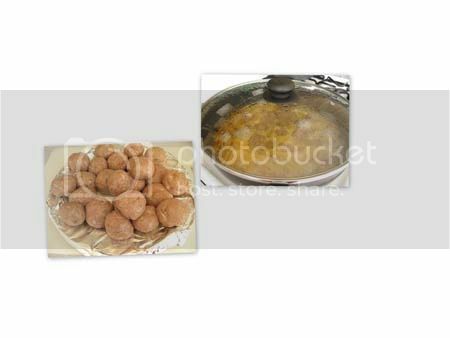 If you have NOT fried the chicken balls, add them(the raw spiced meat balls) to the gravy now. If you did not pay attention and have fried the chicken balls you can add them to the gravy at the second last step. Cover and cook till the balls are done. The balls will cook pretty quickly in the steam and will be done in 5-7 minutes. Check for seasonings, add the chicken balls to the gravy, mix everything well and garnish with finely chopped corriander leaves.